So that was that. 18 months after the date of the referendum on Scottish independence was announced, the vote happened and the answer was ‘No’. The result was closer than most would have expected back then; wider than most probably expected in the final month. The emotion and rhetoric ramped up in the final run-up to the vote, culminating in a massive Yes rally in George Square. No-one could possibly argue that this rally wasn’t well-intentioned and good-natured (especially when compared to what came later, which I’ll come back to) but it inadvertently highlighted a big part of the problem with the general pro-independence movement. Its considerable denial that nationalism was playing any part in their movement meant that they couldn’t understand what was happening outside the bubble; its conviction that all progressive thought and moral righteousness was with them was alienating to anyone who hadn’t drank the Kool-Aid. The movement cemented into a self-defeating narrative of the enlightened (who were able to pierce through the bias and scaremongering of the mass media, ‘Westminster’ and ‘establishment’) versus the scared and huddled masses who were blinded by all of the lies. Critical thought was replaced by grasping onto anything and anyone who supported a pro-independence stance and dismissing everything which didn’t as part of some wicked conspiracy. This absolute, passionate certainty made itself known very vocally and, I think, was largely to blame for the incredibly different experiences of the campaign reported by Yes and No voters. The thing is, I don’t think most engaged people would deny that the media isn’t ‘objective’ and has an inbuilt bias towards the status quo. Greater minds than mine have already tackled this. The answer to this, I think, is to cultivate a critical approach which enables you to consider everything you read/see and why/how it is being presented. This allows you to understand and form arguments which don’t rest on any single source and, crucially, make the argument to others in your own way. It’s not to repeatedly assert that the media is biased while continually posting columns and articles from this media which support your point of view – that’s completely nonsensical. It’s definitely not to vocally make the argument that most people are being fooled while you can see ‘the truth’, leading only to the misguided notion that the people you should be convincing are idiots. While it was undeniably the case that many of us got carried away in the heat of the campaign’s final days, it’s to be hoped that the aftermath will let everyone step back and take stock. It’s already clear, however, that at least a sizable minority of the independence campaign remains firmly in the grim of an almost pathological certainty that their cause is the only ‘good’ and ‘true’ one. In the space of a few days we’ve gone from rhetoric centred on the ‘sovereign will’ of the Scottish people and the ‘democratic carnival’ of the referendum campaign to a wounded, embattled pride that the vote was stolen by ‘fear’ and Yes voters are the forces of light. Jim Sillars has thrown his toys out of the pram quite spectacularly, throwing around allegations of fraud and insisting that pro-independence forces dispense with a referendum strategy completely. Many, led by the vile Wings Over Scotland, have been directing deeply unpleasant rage at Scotland’s over-65 year olds, who voted overwhelmingly against independence compared to 16-17 year olds who voted for it. Even on its own psychotic terms (any consideration that your vote at 65+ is going to be influenced by radically different factors than if you are a teenager is entirely absent) this makes no sense – a majority of 18-24 year olds voted against independence while the disparities in support from those aged 35-54 are hardly significant. Astonishingly, much of this has been fanned by the First Minister himself today. So far, then, there has been no significant attempt to take stock by pro-independence forces. In fact, there have been concerted attempts to make sure this doesn’t happen, with lots of talk of ‘keeping the momentum’ and ‘building the movement’. There can be no question of doubt creeping in. This statement by National Collective is fairly typical: they lost because of “the full might of the British state, corporate and media power, that was designed to demonise, smear and alienate”. There are the usual mentions of ‘hope’ and ‘fear’, complaints about ‘scaremongering’ and statements that the Yes campaign wanted “to make people think”. There is not an inkling of self-criticism. They write of pensioners being ‘lied to’ about the affordability of their pensions as if the alternative view is self-evidently correct – but it’s not. They would have had to make the case beyond ‘it’ll be fine’ and ‘it’s scaremongering’, which was the response to far too many of the concerns raised. This isn’t to argue that an independent Scotland couldn’t afford pensions but that the claims of scaremongering and ‘fear’ largely replaced actual argument. ‘Fear’ is clearly in the eye of the beholder anyway – once the SNP decided on its ‘vote Yes or the NHS is doomed’ line, the entire Yes campaign swung behind it without criticism. Anyone who’s looked at National Collective’s Twitter over the past few weeks would have seen plenty of ‘scaremongering’ that a post-No Scotland would be a dystopian hellhole. Their complaint is not so much that people were scared but that people weren’t scared into the right result. It’s risible and embarrassing. It’s important to reiterate at this point that this does definitely seem to be a minority response. This blog from Peter Matthews, who voted Yes, is a masterclass in a reasoned, thoughtful response and I’ve had some great discussions with people who were vociferously Yes. Yet the reason the minority response made me want to write something is in the indications that it wants to make itself a dominant force in Scottish politics. That indication is in the movement christened ‘We Are The 45%‘. On the morning of the referendum I wrote that I feared a Yes vote would send Scotland down a cul de sac of self-delusion and this is exactly the kind of thing I meant. It underlines how divisive this has been, and how accurate the predictions of the debate eliding class solidarity were, that we have thousands of people engaging in hyperbole essentially resting on the idea that they are the ‘goodies’ and the people who voted No are the ‘baddies’. Someone who voted Yes because they hoped that an independent Scotland would tackle a ‘something for nothing culture’ (Tory language if ever there was) took me to task for criticising this movement, highlighting how utterly bizarre things have become. The denied nationalism remains denied but is more overt than ever, with the movement’s central conviction being that independence is the only path to social justice and many pleas to ‘make Scotland yellow’ by voting for the SNP en masse in 2015, albeit with a smaller benefit for the Green Party also. Indeed, the ‘it’s not about the SNP’ arguments have swiftly fallen apart with a movement utterly unable and/or unwilling to critique them in any way, despite them never once (for example) coming out against the TTIP or explaining how they would avoid austerity (especially as a new member of the EU). We Are The 45% is more of this ‘things will get better because independence’ magical thinking. Apparently there are suggestions that it may change its name to be more ‘inclusive’ but I don’t see how a movement premised on ‘independence will lead to social justice, No voters were scared and tricked’ can ever reach beyond its bubble. It’s the Yes campaign making the same errors and being too wrapped up in sentiment to question it. There are already movements for social justice across the UK which we could all pour our energies into. The awful events in George Square on Friday night were a gift for this bruised pride in being the ‘good minority’. I wrote about the likelihood of sectarian violence kicking off in Glasgow on Twitter last May, after spending a couple of hours walking around its East End and seeing countless union jacks and ‘no surrender’ slogans. I lived in Bridgeton, an area mired in sectarianism, for about five years and I was unsurprised to see allegations that the George Square trouble had its roots there. This problem has existed for my entire lifetime and these people were always going to make themselves heard, whether the result was Yes or No. Yet some, whether because of a desire to lash out or a lack of understanding of sectarianism, have attempted to portray these people as ‘what No voters wanted’ (actually written on Facebook) and an example of the British nationalism which independence would have magically made disappear. I can understand the temptation to make these arguments (and certainly when faced with polls like the Buzzfeed one above) but they’re entirely cynical and profoundly depressing if they offer a glimpse of the future. People can unite to tackle the horribly complex problem of sectarianism, as they can unite to tackle the horribly complex problems of poverty, misogyny, racism and more, or they can retreat into a conviction that it’s all the fault of those other people and that only getting independence will sort them. This will go absolutely nowhere. On the part of No supporters stepping back, we need to be wary of responding to Scottish nationalist sentiment by turning a blind eye to or inadvertently supporting British nationalism, whether that be the extreme kind we saw or the more insidious kind which boasts of ‘British values’ and the like. The goal must be social justice and solidarity, not the ‘United Kingdom’. Clearly it’s still very early days and the chips are still falling. We have the greatest chance in our lifetimes so far of a massive devolving of power across the UK and we have to ensure it happens. I can understand and can’t complain about people fixating on the ‘timetable’ promised by Gordon Brown but, for my part, I’d actually rather the change was more considered. A constitutional convention looking at the entire state seems like the best option and the one most likely to deliver lasting, useful change. I think a cobbled-together ‘devo max’ delivered in the next 7 months or so will only lead to further issues. What’s now clear is that the majority of people in the UK want to continue pooling resources, sovereignty and effort and we need to make that work. More importantly, we need to tackle the regressive attitudes which most people in every region of the UK have about welfare, immigration, employment and the like and actually build a movement to try and make things better. It’s important that we realise that there are no politicians and no parties who will just ‘make things better’ – I just finished reading this book which is a sobering account of the range of forces which stood against radical left-wing change. The British state was such a force but I agree with Phil Burton-Cartledge here that this state is now weakened and is best tackled by unity; the might of the capitalist system, on the other hand, is even greater now. The author argues that any response must be as united and as international as possible to have any hope of success. God knows this will be difficult but I firmly believe it’s something we can only do together – a hefty part of the left in Scotland setting off on an endless quest for independence will only damage us. I hope we can progress from recrimination and bitterness to forge alliances anew – or even for the very first time. My previous blog was about the contortions which the Scottish left have been making to avoid facing the fact that the pro-independence movement has been utterly dominated by nationalism. It’s a position, I’ve noticed, which tends to frequently be associated with ‘Green Yes’, as if saying you support the Green Party (who got less than 5% of the vote at the last Scottish Parliament election) removes the wider context. A context in which, since I last wrote, the First Minister has drawn allusions between independence and apartheid, drawn distinctions between the ‘Team Scotland’ of Yes and the ‘Team Westminster’ of No and applauded a protest against the public broadcaster utterly dominated by flag-waving. You will search long and hard for condemnation of any of this from the Scottish Greens, who appear to have utterly abandoned any criticism of the SNP, or indeed from most of the left who support independence. For all the criticism of Labour sharing platforms with the Tories (something the SNP have no business complaining about, as Annabel Goldie pointed out) they at least haven’t completely given up the business of being an opposition. Yet much of the left shouts ‘it’s not about the SNP!’ while offering absolutely no alternative beyond ‘there are some far-left parties too’, choosing to ignore the Hollywood treatment being afforded to the nationalist politicians and the very ugly scenes we’re seeing on Scotland’s streets. Let’s be in no doubt here: if this was UKIP or another brand of English nationalism, no-one on the left would have any difficulty in drawing links between such events and the language and tone of the nationalist politicians, who would be swiftly and widely condemned. Thus the complete collapse of a large section of the left in Scotland with its embrace of a nationalist project as a shortcut to what they believe will be a socialist dawn has been tragic to behold. 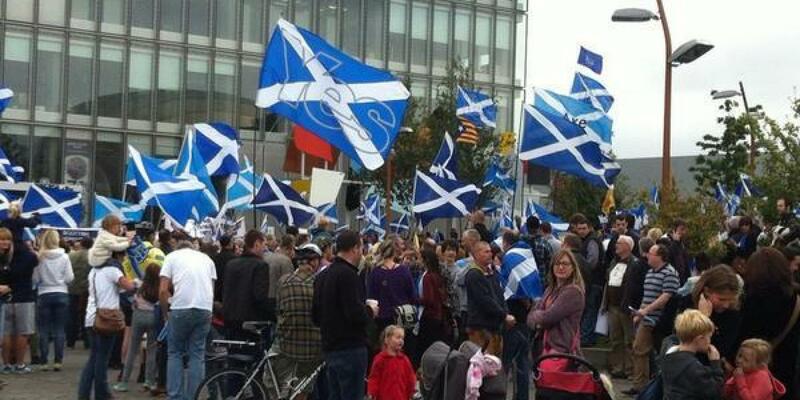 Some, certainly, will be thinking of voting yes on Thursday, not from nationalism, but in the hope of social change. Yet they will not get it, because, like it or not, they are voting for a nationalist outcome. The likening of Scottish independence to anti-imperial movements is a devastating repression of Scotland’s own deep complicity in the British imperial project. This quote leapt out at me because, while the left in Scotland has largely gone down the rabbit hole, much of the left in the rest of the UK has revealed itself to be utterly clueless (and rather opportunistic) in its analysis of the debate. It has rarely risen above the level of ‘this has been presented as the progressive view, I am progressive, hence this is my view’. Billy Bragg, advocate of a ‘progressive English nationalism’, suddenly comes over all coy and denies that independence is about nationalism (he also, incidentally, repeats the common trope that independence will save Scotland from the TTIP, despite no major party in Scotland opposing it and the SNP explicitly welcoming it). You’ll notice his line about Scotland ‘regaining its sovereignty’. This has been a central theme in the analyses of the rUK left. Anthony Barnett’s astonishingly patronising open letter to ‘Scottish voters’ (which, it becomes clear, actually means Yes voters) begins by suggesting independence could be a model for world peace and only gets worse. He draws analogies with Tibet, Chechyna, Palestine and in the comments actually compares independence to a slave achieving freedom. Dan Hind has written several times about Scotland achieving its ‘freedom’. George Monbiot and Suzanne Moore have wheeled out successive columns berating ‘London’ for its ignorant treatment of Scotland, dealing in nationalist myth-making, while being completely blind to the irony of these being their first columns devoted to Scotland in living memory. The idea that Scotland is aiming for ‘freedom’ is also common on social media. Yesterday I had to point out to an activist that Scotland was not colonised and was not comparable to Palestine. Last week a long-term mutual follower on Twitter blocked me after I questioned her assertion that an independent Scotland would be an ‘ex-colony’ of England. You’ll notice, as I noted in my last blog, that the arguments about Scotland achieving its ‘sovereignty’ and ‘taking control of its destiny’ almost never extend to its membership of the European Union and other transnational bodies, still less to questions of economic democracy (the interventions by various banks and companies last week caused wide outrage but rather than leading people to the conclusion that perhaps transnational capital might be the enemy here, we instead ended up with more nationalist drivel about the Tories coordinating the campaign and the SNP somehow being an exit from it). No, the arguments are always aimed at ‘England’ and ‘Westminster’. 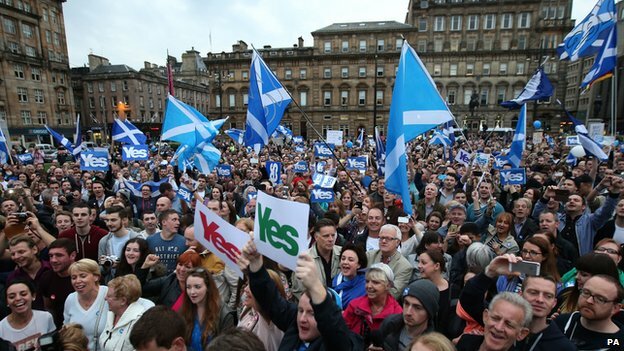 The dominant narrative seems to be one of Scotland as the plucky, oppressed underdog. All this analysis offers is a glimpse of the patronising ignorance of those who advance it – ignorance both of Scotland’s history and its central role in Empire, and of Scotland as a nation. A half-hearted nation will want to hold fast to its grievances, and in that sense Scotland has done well. The nation’s brickwork is cemented with resentments, from ruined monastery to erupting towerblock: blame, fear, bigotry and delusion, their fragments powder the common air – and always the fault is seen to lie elsewhere, with other nations, other lives…Yet the problem is not the Parliament, it’s the people, and the people’s drowsy addiction to imagined injury – their belief in a paralysing historical distress – which makes the country assert itself not as a modern nation open to progress on all fronts, but as a delinquent, spoiled, bawling child, tight in its tartan babygro, addled with punitive needs and false memory syndrome. Free-falling anxiety about Scottishness has a tendency, among Scots, not only to turn into hatred of others, but into hating bad news about the country itself, and seeing critics as traitors. It’s not easy reading, certainly, but I think it’s a deeply insightful one and it largely captures the mentality which Scottish nationalism plays to. This is what makes it particularly tragic that so many of the left have pursued it, convinced that things would be better if not for ‘Westminster’ and, as the Guardian put it, pursuing the ‘unattractive’ habit of “attacking the messenger and ignoring the message”. Indeed, if there was any doubt that a demogogic, cynical populism is significant here you need only look at the endless outpouring of criticism and ridicule aimed at any No supporter deemed to be part of the ‘establishment’ (a terms used spectacularly nebulously here) and their contrasting with the SNP who, lest we forget, have been the government of Scotland for years now and are led by as establishment a politician you could possibly find. Nationalists, however, have a knack for painting themselves as figures of rebellion, even when they offer little more than a change of paint. Scotland goes to the polls in three days now and the result is too close to call. I am certain, however, that the swift narrowing of the polls owes more than most would like to admit to the nationalist sentiment which is currently being inflamed. Perhaps in response to this, the latest line from pro-independence lefties has been that anyone who opposes it must necessarily be a British nationalist. I’ve read this repeatedly in the past few days, and have had it thrown at me more than a few times. Of course it will be the case that some, perhaps many who support the UK are nationalists. The fact remains, however, that it’s the Scottish nationalists who have shifted the ground beneath our feet. I have attended anti-fascist marches, protested against the 2012 Olympics, protested against the Jubilee, protested against the Royal Wedding, was a vocal critic of the hoopla over the royal baby, have long written about and campaigned against our immigration laws and have never laboured under any illusion as to the negative force of British nationalism. I do not become a British nationalist because I oppose a false notion of ‘independence’ premised on the absurd idea that Scotland is not free and instead support the notion of common solidarity in the belief that the real oppressions which matter are those which transcend borders: class, race, gender, sexuality and so forth. As I wrote previously, this solidarity is codified into the UK at present, even if we have to fight long and hard to achieve it and then fight longer and harder to effect change. It’s no secret that the left is in a dire state at the moment: unfortunately aforementioned collapse of much of the left into nationalism is only going to ensure this remains the case for a long time to come. Presumably because nationalism has such a regressive reputation (to put it mildly) and the Scottish Yes campaign wants to be viewed as the sole repository of progressive thought in the UK at the moment, one line I keep seeing wheeled out is that independence ‘isn’t about nationalism’. We’re asked to ignore the fact that it only became an issue because the nationalist SNP, a party which lest we forget has one single unifying cause, won a majority in Holyrood (with poll after poll putting support for independence at a third or less of the electorate around that period, no-one could possibly argue that it was a necessary response to a swell of demand). We’re asked to ignore that the independence on offer has been framed almost entirely by the SNP, not least with their White Paper which amounts to an SNP manifesto. We’re asked to ignore that the Scottish NHS only appeared to become ‘under threat’ when the SNP decided it was a few weeks ago (an SNP who don’t oppose TTIP, which is one of the most commonly mentioned ‘threats’). We’re asked to ignore, of course, the ubiquitous presence of the Saltire and its colours (seen most commonly in the ‘Yes’ twibbon which adorns many social media profiles). Most absurdly, we’re asked not to parse the ‘us and them’ rhetoric which has so characterised this debate – a rhetoric which many Yes supporters seem unwilling or unable to accept as a reality but rather just another example of pro-unionist ‘scaremongering’. The ugly language which has greeted Jim Murphy (a politician I am no fan of) and, more to the point, vocal No supporters at his meetings – cries of ‘traitor’, ‘Apartheid Jim’, ‘quisling’ and even “stop acting English” can be heard in videos – can only seem to be condemned in the most half-hearted manner imaginable. Not only are these condemnations invariably followed by a ‘but’, they were also widely-followed both by assertions that Murphy and the No campaign were making capital from the scenes but also even behind some of the aggressive behaviour themselves (what a great phrase to google). Speaking anecdotally, of course, I have yet to have a debate with a single pro-independence person which doesn’t result in them pushing nationalist myths. The most common, and one I have already written on, is the notion that the people of Scotland are ‘different’. Their social democatic (or socialist depending on who’s making the argument) impulses are frustrated by conservative voters in England. Scotland did not vote for the Bedroom Tax (we must ignore that England didn’t either). Scotland did not vote for the restructuring of the NHS in rUK (neither did rUK). Scotland doesn’t get the government it votes for (as most people don’t – just as most of the UK did not vote Tory or Liberal Democrat at the last election, most of the Scottish electorate did not vote for the SNP at Holyrood. This is the nature of representative democracy.) The left has made much capital from this myth of difference, advancing ideas that an independent Scotland will be a left-wing beacon for the world. When examined, however, we see that these ‘not nationalist’ arguments rely on mischaracterising, lifting of SNP policy and plain fantasy. This Rainbow Paper released by LGBTI Yes campaigners is a perfect illustration of this. I could write much devoted to this single document but suffice to say it’s full of assertions about the ways in which Scotland will be ‘better’ with absolutely no explanation as to why and how this will happen. Its promise of a ‘more humane immigration’ policy, for example, completely ignores the fact that a majority of the Scottish people want immigration rules made tougher and think immigration has been ‘bad for the British economy’. It’s also interesting that the Paper promises that an independent Scotland would “take a more proactive approach to promoting LGBTI equality and human rights around the world than is currently done by Westminster on our behalf.” This is the rhetoric of ‘humanitarian intervention’ and it’s again notable that Scotland is no more against military intervention than rUK. What we find overwhelmingly in the Yes campaign, then, are people whose views are more left-wing and progressive than the rest of the general public’s believing that these views would be widely shared if it wasn’t for rUK. If this isn’t a nationalist argument, I’m not sure what is. We’re asked to believe that the magical power of independence will destroy neoliberalism and British nationalism (this is fine to criticise because it’s a ‘nasty’ nationalism rather than a ‘civic’ one, apparently) and usher in a new dawn. How this will happen, no one can say. If it’s seen to rest on common solidarity and fighting together, the argument in favour of independence crumbles because such fights are already happening around the UK. The nations of the UK have seen significant decreases in headline levels of poverty over the past two decades, particularly in the years before the economic downturn. Since 2007, the path of poverty has shifted, from a general picture of falling poverty levels to a more nuanced one. Poverty levels in England have resumed their gradual downward path, while the lowest levels of poverty in the UK, found in Scotland, have levelled off in the last three years. In Wales and Northern Ireland, increases in poverty have been more marked; in the former they appear to have stabilised, in the latter they appear to be falling once again. UK and England shows a six percentage point difference in poverty levels before and after housing costs. The redistributive functions of government require pooling risk across the largest possible area to insure against the uneven impact of economic shocks. And so for many aspects of the social security system – particularly for cyclical and redistributory benefits – the role of central government remains key. Who could read this and think that poverty is inflicted on Scotland by Westminster, or that Scotland could only tackle poverty if it was independent? Yet a significant aspect of the nationalist rhetoric around independence is the idiotic idea that Scotland should look after ‘its’ poor because ‘Westminster’ doesn’t care about them. At best, the majority of the Scottish people will find little difference under Holyrood than under Westminster and it could be worse if a global crisis erupts again. Scotland as a small economy, dependent on multinationals for investment, still dominated by British banks and the City of London and without control of its own currency or interest rates, could face a much bigger hit than elsewhere in terms of incomes and unemployment. Wandering into independence based on the idea that Scotland is somehow except from the realities of existing capitalism is, again, a nationalist notion. The fundamental importance of an economic analysis such as Michael Roberts’ is obscured by demagogic banalities such as ‘don’t you think Scotland should control its own destiny?’ and ‘why aren’t we better together now?’ The former line is, in a slightly altered form, the exact argument UKIP makes in favour of leaving the EU – something few Yes campaigners are vocal about because anti-EU sentiment is not viewed as ‘progressive’. Under the logic of nationalism pooling wealth and sovereignty makes perfect sense amongst 28 countries but is inexcusable amongst 4. Also, as Roberts argues, the EU has been a major force in pushing austerity policies upon its members but the lack of any analysis other than the nationalist one means this reality is lost. It’s easy to ask ‘why aren’t we better together?’ when the only point of comparison is a mythic place the likes of which currently cannot be found elsewhere in the world. Nationalism, then, is absolutely central to the independence case. Indeed, it’s telling that the lines about how it’s ‘not about the SNP’ but rather ‘democracy’ and ‘the will of the people’ are completely abandoned when it comes to taking the argument to No supporters. Most of the arguments against the United Kingdom rely on anti-Tory rhetoric, anti-capitalist arguments and liberal use of phrases like ‘illegal war’ (an illegal war which, lest we forget, the apparently democratically-superior Scottish Parliament supported – but in another supreme turn of ‘not nationalism’, this is excused on the basis that it was the ‘unionist parties’ who voted in favour). I have been repeatedly told that I am ‘partnering with the Tories’ and ‘not on the progressive side’ despite the fact that I have been a socialist all of my adult life and was voting for socialist parties when Scotland was still heavily in the grip of Labour. I’m told I’m a ‘British nationalist’ despite the fact that my instinctive anti-nationalism has led me to critique and march against jingoism on many occasions. Yet the arguments remain difficult to argue against, because you’re arguing against thin air. For independence to make sense it must be a case of us and them and so other progressive forces either must be denied or subject to absolutely tortuous arguments about how the magical power of independence will free them. It comes back, again and again, to the fantasy of Scottish exceptionalism, no matter how often it’s denied. I’ve written here about Scottish independence only once before, largely because it seems more hassle than it’s worth. Opinions run high, to put it mildly. As a Scot who is now based in London I don’t have a vote but, if I did, I’d almost certainly vote ‘no’. This isn’t because I’m a ‘unionist’, a ‘loyalist’, a ‘Tory’ or any of the other absurd slurs which tend to be wheeled out when you state this position. It is rather because I find myself more sympathetic to arguments based on cross-border solidarity and a combined push towards socialism. That’s how I approach the question of independence – as a socialist. I’ve long been a critic of Labour, the kind of person who gets called ‘a Trot’ by the kind of person who participates in NUS, and the sole time I’ve voted Labour in a General Election was in 2010 when it was clear the Tories had a real chance of winning. I would never and have never voted Tory or Liberal Democrat. I say this only to counter the inevitable assumptions that some would make as a result of my stance. As I wrote in my previous blog on this issue, I think the problems Scotland faces are rooted in a global neoliberal capitalism rather than being the ‘fault’ of Westminster or even England; I concomitantly find the argument that independence = ‘more democracy’ to be rather meaningless in an age where global capital is largely unchallenged and easily overrides national governments. Anyone who’s watched the documentary You’ve Been Trumped will be under no illusion that the SNP are immune to this. As I’ve also previously said, the debate around independence has been utterly woeful. I don’t need to dwell on how terrible Better Together is because pretty much everyone accepts it at this point. What’s less accepted is how awful the ‘Yes’ campaign is. We’re continually told that ‘Yes’ is positive, inspiring, creative, energetic and a heap of other adjectives which sound like a Shoreditch marketing brain fart on a Monday morning. This has taken hold to the extent that any criticism or questioning of ‘Yes’ or independence is immediately met with howls of derision about ‘negativity’ and ‘scaremongering’. I don’t think it has been widely considered how important the framing of this issue has been, not least in the referendum question itself. Of course a ‘no’ campaign is going to be ‘negative’ – it’s in the name! What matters is whether the negativity has substance. Sometimes it does, sometimes it doesn’t – recognising which is which requires critical engagement rather than a facile, silly dismissal on the basis of ‘negativity’. This dismissal and much of the rhetoric around ‘Yes’ seems strongly linked to the cult of positivity/’positive thinking’. Much has been written on this elsewhere but one fundamental aspect of the phenomenon is its dampening of critical thinking, which is portrayed as ‘negativity’. I can hear the howls already. I’m not for a second saying that the ‘no’ campaign has been an exemplar of critical thinking and I’ll re-iterate that I think it’s been dreadful. I also think, however, that too many of the responses to anti-independence arguments have been led by this guff which would have us believe that ‘Yes’, as a ‘positive’ message, isinherently good. Keep this in mind when reading much of the ‘Yes’ rhetoric and I think it’s impossible not to notice. Closely linked is the ‘Yes’ obsession with theopinion of ‘creatives’, people who are presented to us as fetish objects, a cut above your ‘non-creative’ types. I don’t think it takes much thought to realise how problematic this is but, again, it’s so unquestioned that even this sympethic interview with Alistair Darling presents the lack of ‘writers and artists’ in the ‘No’ campaign as a ‘problem’ for it. ’No’ faces a dual problem here, then: it is not only negative, it also sets itself against this inherently good positivity and creativity and so becomes even more easily positioned as the petty carping of small-minded people. This brings me to the one aspect of the ‘Yes’ rhetoric which has probably bothered me more than any other, the positioning and contrasting of nationalism and racism in Scotland against that of England. In the acres of text written about UKIP in the run-up to the European elections it was often noted (accurately) that they had less support in Scotland than in England. When they won a seat in Scotland, Alex Salmond said that they were “a party beamed into Scotland courtesy of the BBC”. This message was eagerly taken up by many ‘Yes’ supporters despite it being enormously trite and simplistic. In itself it perhaps wouldn’t be worthy of much comment but it fits neatly with a subtle narrative which has presented racism as an English problem, with much tutting at its anti-immigration attitudes despite the fact that they aren’t hugely different from those in Scotland. A couple of months ago I found myself having a bizarre debate on Twitter with two ‘Yes’ supporters who were adamant that racism was more of a problem in England than in Scotland, citing hate crime statistics and pointing to parties like UKIP and the BNP. Again, there are a lot of fluffy ‘positive’ words about ‘tolerance’ and ‘inclusion’ thrown around to subtly highlight the perceived differences. Make no mistake, having a major party in the UK arguing in favour of more immigration is a big deal and worth praising. It’s not, however, rooted in any particularly marked difference in Scottish attitudes compared to English ones. My own theory, one which informs much of my responses to independence, is that anti-Thatcher attitudes, which bled into anti-Tory attitudes, which in turn bled into anti-Westminster attitudes, have created a buffer for a particular strand of Scottish identity (one which has been on the increase) which defines itself in opposition to a conception of England rooted in a Tory-voting South East. This identity has no time for the notion that much (most?) of England is largely indistinguishable from Scotland in its attitudes to social and political issues; no time for the fact that most of England does not support the Tories and certainly no time for the history of Scotland’s intrinsic involvement and benefit from colonialism and imperialism. Its founding myth is that Scotland is different and it requires England to be right-wing in order to sustain this. I think it’s a quite similar dynamic to anti-EU sentiment in England which similarly finds its expression in nationalism – but the different dynamics at work there make this nationalism more identifiably rooted in national myths and much uglier. It could be argued that it’s a positive force in Scotland in some ways, uniting enough people in its collective myths to create a small but crucial space where it is more progressive in its politics. Yet that’s a precarious position to be in, liable to collapse in on itself if the dynamics change. 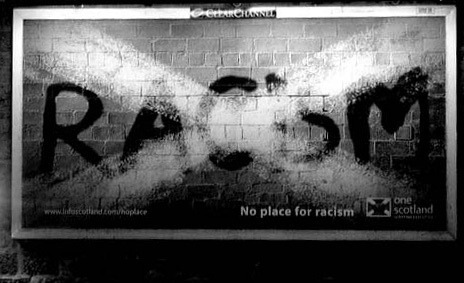 I have absolutely no time for anyone who would deny that racism is a problem in Scotland and turning it into a competition or campaigning tool is insidious. The lack of independence was not to blame for the racist abuse which I witnessed my Korean-born friend face almost every single time I spent any time with her in the East End of Glasgow, just as it was not to blame for the casual racism I would hear on a daily basis (usually with regards to corner shops, takeaways etc). It’s possible to argue that independence would destroy the anti-Westminster buffer and cause those who hold onto these myths of Scotland to look at themselves more honestly. If so, it might even be worth it. Yet it seems so ingrained now that I can’t see it changing any time soon and the positive infuence of the myths could be destroyed. After all, the cult of positivity loses its potency when you don’t have the perceived negative force to rally against. It’s easy to understand why many in Scotland are caught up in the ‘positive’ myth of a better nation – but the ‘Yes’ notion that Scotland is alreadyinherently that nation attempts to destroy UK-wide aspirations towards it. Many throughout the UK want it – I know some myself and I encounter many more. I think this is where many ‘no’ people are to be found. They aren’t British nationalists, royalists or eager supporters of the status quo. Instead they want a better society which doesn’t end just before Carlisle and find the dog-whistle messages that England are the evil Empire to be a distraction – an obstacle, in fact – to this. They think a change in the system of governance in Scotland is not going to deliver this better society. Only work, solidarity and a collective will can do that and that means leaving no-one behind. That sounds utopian, yes – that’s the ‘positivity’ to be found in ‘no’. It’s just not compelling because a long hard slog isn’t particularly ‘positive’, especially when contrasted with the myth of quick and radical change. But myths and a misplaced valorising of positivity displace aspirations, dividing and ultimately weakening us. Edit: And if you want to see why I began by saying that it seems more hassle than it’s worth, look no further than this quite ridiculous response where I’m basically history’s greatest monster. I find this piece fascinating in its highlighting of what infuriates me about much of the independence debate. It’s certainly a level beyond Better Together’s ‘independence will be armageddon’ or the Yes campaign’s obsessive sniping at ‘unionists’ but it highlights just how inadequate this debate is in many ways. Greig complains of “the UK goggles which say you never ask questions” but then we’re later told “Greig said that the outburst in October by the comedian Russell Brand, who said he had never voted, was a symptom of wider alienation with the democratic system in England”. Brand’s words clearly hit a nerve, suggesting the idea that people in the UK are generally living in some catatonic trance is rather misguided at best. Yes, there is much disillusionment with the UK political system – that is different from ignorance which Greig initially complains about. There is a tangible sense that a significant proportion of people in the UK want political change – indeed, there is this sense in most of the developed world. What Greig is complaining about here is capitalism and, with his words about being estranged from the economy, he is echoing Marx’s theory of alienation. The City of London could be described as ‘hyper-capitalism’ but given that we all live in a capitalist system, its ‘faults’ are by no means unique. The idea that an ‘independent’ Scotland could reject these basic tenets of capitalism is naive, to say the least. Greig states that “London is essentially an entirely different economy, an entirely different society”. Reading this as a socialist, I find it pretty harmful stuff, eliding the common class interests which exist across the UK and indeed the world in favour of some notion that London is the Capitol in contrast to the rest of the UK’s Districts. People in London are not the enemy and most of them share the same concerns, fears and hopes as most people in Scotland…or Greece, or Spain or etc. Since the (ongoing) financial crisis, there is a widespread sense that capitalism is deep inside one of its periodic moments of crisis. This brings misery but also opportunities to expose the fundamental contradictions of capitalism and drive change. Much of the political action we’ve seen around the world in recent years, from Occupy to SYRIZA to the Scottish independence movement, seems to largely be a response to, and attempt to capitalise on, this crisis. In order to do this, however, we need to know what we’re fighting against. Greig says “We don’t need to reform the House of Lords: we need to start again” yet in failing to identify ‘capitalism’ as the fundamental problem he’s discussing he ends up advocating a different kind of reform. Indeed, it’s noted that he would be open to rejecting independence if the ‘pro-UK’ parties offer “greater devolution and reform.” Fine, in and of itself, but ultimately nothing that will address the roots of Greig’s disaffection. When he says that “Scotland’s first independent government would make mistakes and disappoint people who had campaigned for it” it’s difficult not to conclude that this is the inevitable result of a capitalist democracy with social democratic leanings under the current system of global neoliberalism. Indeed, it’s notable that the sole mention of the EU in the piece is in reference to the ‘modernisation’ of the ‘old nation state’. One of the biggest issues I have with the independence movement is that it seeks to critique the union of the United Kingdom yet, because of the offer on the table, has nothing to say about the European Union and in fact tacitly accepts that it’s a ‘progressive’ institution. Yet by any stretch of the imagination the EU is far less democratic than the UK. It also has immense power over the future of any independent Scotland. From the actions of the Troika to its current negotiations regarding the Transatlantic Free Trade Agreement, far-reaching and possibly mendacious decisions are made with little-to-no scrutiny in the UK (or Scotland). A large part of the reason for this is that ‘anti-EU’ rhetoric has been largely lost to the right, despite the efforts of coalitions like No2EU, so the idea that the EU could be pushing austerity, privatisation and an attack on welfare states is at best mocked, at worst ignored. Similar points could be made regarding NATO, the Council of Europe, the UN and the IMF. There is no such thing as true ‘independence’ and we cannot choose to criticise one ‘membership’ while deeming the others to be off-limits. The same is true of ‘English nationalism’. The Scottish independence debate has been pushed by the Scottish Nationalist Party and is seen as a progressive force. Yet in complaining that such a debate isn’t happening in England, it’s impossible to ignore that anyone labelling themselves as ‘English nationalist’ is immediately viewed with distrust. It’s ground which has again been abandoned to the right. Clearly there are complex and often legitimate reasons for this, with the legacy of Empire having damaging effects on the English psyche. However this narrative obscures Scotland’s own history as a partner in Empire and its own current problems with racism. As we’ve seen, a ‘progressive’ discussion about the future of the political system can originate in England. Some argue that independence is a way for Scotland to move beyond its tendency to positively contrast itself with England/London/Westminster. This would undoubtedly be healthy and I find it to be one of the most compelling arguments in favour. It would also be remiss not to note campaigns such as Radical Independence, which has offered critiques from a left perspective. Yet the debate generally seems to insert damaging division where there should be class solidarity. It’s completely lost, for example, that most people in England did not vote for the Tories or that no-one voted for the Bedroom Tax. It’s also completely lost that “Although Scotland is more social democratic in outlook than England, the differences are modest at best.” ‘Westminster’ is not waging a war against Scotland but rather conducting a class war across the whole of the UK. It seems clear to me that the argument which needs to be won is not whether Scotland is capitalist within the EU or within the EU and the UK; rather, we need to be reminding people of their class solidarity regardless of nationality and encouraging further debate regarding capitalism and our current global political system. There are certainly arguments that independence can play an important role in this but, on the whole, I see only the naive and obfuscatory narrative found in the article above which confounds matters at a time when the majority in the UK should be united.